Hyde Park. Flickr/Mario Sanchez Prada. Some rights reserved. The question of the Muslim veil never seems to leave the headlines for long. If the debate is not about whether states, such as France or Belgium, should have the right to ban the veil in public, it is about what limits there should be to the wearing of the burqa in those countries that do not ban it, such Britain or Germany. The latest controversies erupted in Britain last month after a defendant in a criminal trial demanded the right to wear a burqa in court and a college ended its ban on the practice after students challenged it. “This is not about the burqa”, the French philosopher Bernard-Henri Lévy claimed in 2010 in the midst of the French debate on the burqa ban. “It’s about Voltaire. What is at stake is the Enlightenment of yesterday and today, and the heritage of both, no less sacred than that of the three monotheisms.” Leaving aside the absurdity of the idea that the entire weight of the Enlightenment tradition should rest on banning a piece of cloth worn in France by a few hundred women, Lévy is right in this: the debate is much more than about a handful of women (in Western countries at least) wearing the burqa or niqab. It is about how we conceive of freedom and liberties, values and identity. It is our difficulties in thinking through some of these issues that makes the burqa such a potent symbol on both sides of the debate. I want, therefore, to take a step back and explore three of the issues underlying the burqa debate. What does religious freedom mean? Is such freedom different in a plural society? And what should be the role of the state and of civil society in conflicts over social values? Part of the problem is our unfortunate habit of speaking of ‘religious freedom’ as if it were a special kind of freedom. There are historical reasons for this. The modern debate about tolerance and rights developed in Europe from the seventeenth century onwards primarily within a religious framework. Questions then about what could be tolerated and how freedom of expression could extend were at heart questions of how, and how far, the state, and the established church, should accommodate religious dissent. Today, we live in very different world from that in which concepts of religious freedom first developed. Religion is no longer the crucible within which political and intellectual debates take place. Questions of freedom and tolerance are not about how the dominant religious establishment should respond to dissenting religious views, but about the degree to which society should tolerate, and the law permit, speech and activity that might be offensive or hateful, that might challenge the state or undermine national security. From today’s perspective it is easier to see that religious freedom is not a special kind of liberty but one expression of a broader set of freedoms of conscience, belief, assembly and action. Whatever one’s beliefs, secular or religious, there should be complete freedom to express them, short of inciting violence or other forms of physical harm to others. Whatever one’s beliefs, secular or religious, there should be freedom to assemble to promote them. And whatever one’s beliefs, secular or religious, there should be freedom to act upon those beliefs, so long as in so doing one neither physically harms another individual without their consent, nor transgresses that individual’s rights in the public sphere. These should be the fundamental principles by which we judge the permissibility of any belief or act, whether religious or secular. What has changed today is that the faiths demanding freedom to dissent are not primarily Christian. There is a sense, from both proponents and opponents of the burqa ban, that the growth of multiculturalism, and in particular the emergence of Islam as a social force in Western societies, must necessarily change the way we look upon religious freedom. Many multiculturalists insist that there is a duty upon the state to preserve and to nurture minority communities and their cultural mores. Tariq Modood, for instance, has made a distinction between what he calls the ‘equality of individualism’ and ‘equality encompassing public ethnicity’, the latter meaning “equality as not having to hide or apologise for one’s origins, family or community, but requiring others to show respect for them, and adapt public attitudes and arrangements so that the heritage they represent is encouraged rather than contemptuously expect them to wither away.” But why should I not be contemptuous of certain mores, from whatever culture they derive, or not expect them to wither away? What does respect mean if it is enforced rather than voluntary? To require people to give respect to various cultures and their mores, to insist that public arrangements be adapted to accommodate them is to transform freedom into privilege. Rather than to nurture liberties, it is to imprison cultures. On the other side of the debate, many view non-Western cultures, and Islam in particular, as threats to be resisted. The American writer Christopher Caldwell suggests in his book Reflections on a Revolution in Europe that Islam “has broken… a good many of the European customs, received ideas and state structures with which it has come in contact”. It “is not enhancing or validating European culture; it is supplanting it”. Muslim immigration, in his eyes, is akin to an “invasion” that provokes “the most worrisome” of questions, “such as ‘How well will they fit in?’ ‘Is assimilation what they want?’ and, most of all, ‘Where are their true loyalties?’”, questions that were not, he thinks, raised by previous cultures, faiths or immigrants. In fact, those were exactly the questions asked of previous migrants and dissenting faith groups. The English philosopher John Locke is often seen today as providing the intellectual foundations of liberalism and of modern liberal ideas about freedom of expression and worship. Yet, for Locke, the Catholic Church, had ‘no right to be tolerated’ because, in submitting to the authority of the Pope, Catholics “deliver themselves up to the protection and service of another prince”. This is, in effect, “the settling of a foreign jurisdiction in his own country”. As late as the 1950s, the historian Leo Lucassen observes, Catholicism was perceived in the US as “representing an entirely different culture and worldview, and it was feared because of the faith’s global and expansive aspirations”. Jews, too, were (and sometimes still are) seen as ‘supplanting’ native culture not ‘enhancing’ it. The 1903 British Royal Commission on Alien Immigration, set up because of anxieties about Jewish immigration, expressed fears that newcomers were inclined to live ‘according to their traditions, usages and customs’. According to one witness to the Commission, “There is no end to them in Whitechapel and Mile End. These areas of London might be called Jerusalem”. Two years later Britain introduced its first immigration law, the 1905 Aliens Act, primarily to bar European Jews. There is little new, then, in the contemporary debate about Islam. What Islam does is not to change the terms of the debate, but to give that debate a new, emotional charge (just as did the issue of Catholics or of Jews in the past), an emotional charge that makes it more difficult to rationally discuss an issue such as the burqa . How, then, do we approach the question of the burqa without succumbing to the emotional charge that it carries? A liberal, rational view of tolerance, I suggested earlier, requires that ‘Whatever one’s beliefs, secular or religious, there should be freedom to act upon those beliefs, so long as in so doing one neither physically harms another individual without their consent, nor transgresses that individual’s rights in the public sphere’. Proponents of a ban suggest that the burqa does indeed cause harm. Many worry that burqas would pose security threats, at airports or in banks, and that it makes it difficult to perform certain jobs, particularly those that require face-to-face contact with clients or the public – doctors, nurses, teachers, police officers. These are all valid concerns. But they are also concerns that can be solved on a case-by-case basis without the need for draconian legislation. Airports already require veiled women to reveal their features when passing through security. Police have no problem demanding to see faces when checking ID cards. And if banks insist that people should not wear bulky clothing, so be it. But that is very different from the state imposing an outright ban on such clothes. 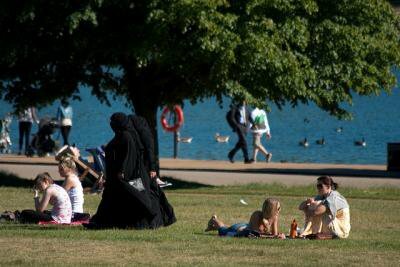 Banning a woman from wearing a burqa in a park will not improve security in a bank or at the airport. If wearing a burqa is incompatible with the needs of particular jobs, then those particular employers – hospitals, schools, shops even - can legitimately demand that employees not hide their faces. But again, one can impose dress codes for certain jobs without banning a type of clothing for everyone. After all, we are quite able to ensure that judges or teachers don’t wear bikinis on the job, without needing a national ban. Others worry that the burqa causes harm by undermining gender equality and making social integration impossible. The burqa is certainly demeaning to women, and often used to enchain them. Many other practices and rituals that Western societies tolerate are, however, also degrading. Orthodox Jewish women must shave their heads and wear a wig when they marry. The Catholic Church forbids women priests. Many Protestant evangelical churches insist that wives must ‘obey’ their husbands and that the role of women is to breed new evangelicals. Nobody seriously suggests that Jewish marriage rituals be banned or that the Catholic church be forced to accept gender equality in choosing priests or that evangelical wives be saved by state legislation from being baby factories. A liberal society accepts that individuals should be free to make choices that may not be in their own interests and that, to liberal eyes, demean them. This applies even to particularly distasteful expressions of degradation, such as the wearing of the burqa. What of the claim that Muslim women need the protection of the law because they are forced to wear the burqa? If women are forced to do something against their will, the law already protects them in democratic countries. But the insistence that women should be compelled not to wear something is hardly a good riposte to the argument that women should be compelled to wear it. In any case, we need to distinguish between coercion and social pressure. Coercion is a matter for the law. Social pressure, however unpalatable it may be, cannot be remedied through state intervention, but must be confronted at the level of civil society, through people collectively challenging unacceptable social mores. Does not the burqa impede social integration? The veil has been rightly described as ‘ghetto walls that a person wears’. It often inhibits normal social interaction – that, after all, is its very purpose – and may preclude those who wear it from integrating into society. But the numbers wearing the burqa are tiny. The French government estimates that fewer than 2000 women wear a niqab or burqa. In Holland some 500 women in a Muslim population of one million do so, in Denmark the estimate is fewer than 200 out of 170,000 Muslims. There has been, as far as I know, no comparable survey in Britain, but there is no reason to imagine that the figures are much different. Given such figures, the burqa or niqab can hardly be held responsible for creating a sense of social separation. There is, in other words, no argument for a blanket state-enforced ban on wearing the burqa in public, such as that imposed in France. The state should no more determine that a woman cannot wear the burqa than it should insist that she must. The fact that a blanket state ban is wrong does not mean, however, that bans are wrong in all circumstances. Issues of security in banks or airports, or of practicality in hospitals, schools or shops may all, as I have already suggested, require specific regulations about facial coverings. To insist that there should be no blanket ban imposed by the state is, however, only the beginning of the debate about the burqa (or of any other social practice), not the end. A key reason for minimizing the coercive role of the state is to allow civil society to flourish. It is not through the state but in civil society that social values emerge, that ideas and beliefs get debated, that we as individuals truly shape the societies in which we live. The values embodied in the burqa and the niqab, the belief that women should be hidden from view for reasons of modesty or religious belief, should have no place in the 21st century. But such values can be challenged, and new ones crafted, not top down through state prohibitions but only bottom up through social engagement. That is also why, from the other side of the debate, Tariq Modood’s insistence that people should be required ‘to show respect’ towards all cultural mores, and that public arrangements be adapted to accommodate them, is so problematic: it is an approach that eviscerates both civil society and the idea of freedom. The corollary to the right to wear the burqa is the right, indeed in my eyes the obligation, to challenge the practice of wearing it. It is not just in the controversy over the burqa, but much more broadly in our discussions about culture and values, that the obsession with the state, and with bans and prohibitions, and the failure to nourish civil society, or even to grasp its importance, damages social life. If we want to get beyond the veil, in the sense both of moving the debate on, and of challenging the values it embodies, we need to think less about state proscriptions, and more about the cultivation and the transformation of civil society.